Get Your Edition Of The Boyd Bugle Today! Every quarter, we send the latest edition of The Boyd Bugle to thousands of customers and friends in Southern California, and all over the world. Subscribers get seasonal safety tips, product updates and humorous interesting stories that can shared with family and friends. 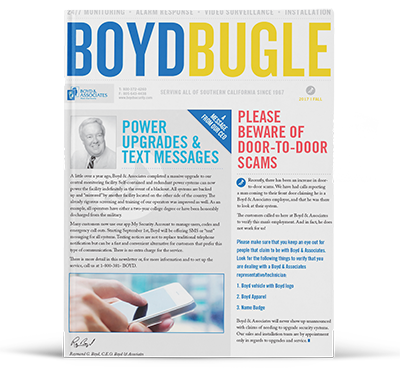 Sign up below to get your print and digital edition of The Boyd Bugle today. Get 3 Months Of Free Alarm Monitoring! When You Refer Friends & Family and They Become A Customer!